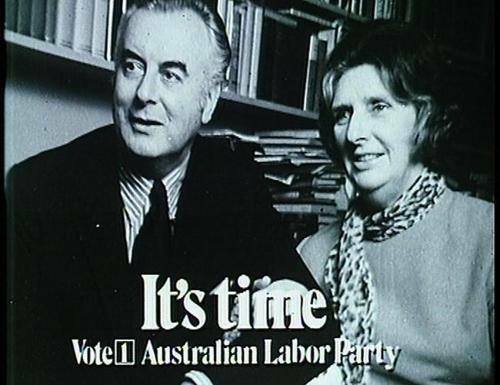 1972: “It’s Time”…I still remember the ALP television ads featuring Alison McCallum, Col Joye, Little Pattie, Judy Stone, Bobby Limb and a host of others. Even before Gough Whitlam and Labor were elected, there was a sense of expectation and excitement that change was coming…not just a change of government but also social change…although none of us could have envisaged at the time just how expansive and inclusive this change would be. And so it was with incredible euphoria that Edward Gough Whitlam became the 21st Prime Minister of Australia. It is now almost impossible to imagine how segregated and submissive the lives of women were in those times. Unequal pay, giving up paid employment on marriage, limited study and career options, almost impossible for women’s to get a bank loan, few women in parliament, on boards, heavens we weren’t even allowed in the public bar, segregated off to the ‘ladies lounge’. Basically there was limited or no choices for women except those ascribed to them. In the late 1960s, many Australian women began to question the restrictive roles that society had assigned to them. They felt that there was more to life than raising kids and taking care of the home. Others were dissatisfied at being confined to traditionally ‘areas of work and study where women were assigned to female’ occupations like teaching, administration and secretarial work. Women were paid under a different pay structure to men, had limited study and workplace opportunities, limited political participation, no protection from violence and abuse and most of important of all, no redress, financial assistance and service supports when women left an abusive relationships. • Women’s Advisor to the Prime Minister: The Whitlam Government was the first in the world to appoint a women’s advisor to the Prime Minister. Elizabeth Reid was appointed to this role and played an important role in advising government on all aspects of the impact of government policy on women. 1975 was the International Year of Women and Australia played an important role on the international stage in working to develop a framework for the development of the advancement of women in all aspects of their lives. • Establishing pay equity…ensuring that women would be paid the same pay for the same work. The Whitlam government passed legislation to ensure women were entitled to the same minimum wage as men. However, the fight for wage equity still continues with women receiving 77% of the male wage. Women retire with only 33% of the accumulated superannuation of men. • Established the Family Court and introducing the Family Law Act to ensure that women were given access to ‘no fault’ divorce. Prior to this, divorce matters were held in the Supreme Court with the applicant having to ‘prove’ desertation, cruelty or adultery. While many barriers still remain for women in receiving justice and fairness within the Family Court System, things have certainly come a long way for women since 1975. • Single Parent Benefit was originally introduced in 1973 as the Supporting Mother’s Benefit. It has since been extended to all parents. This was a critical factor in allowing mothers to keep and care for their own babies without the pressure for giving them up for adoption. It was also a vital support for women who left relationships for a range of issues. • Removal of university fees allowed many women to gain a university qualification. Self included. Women began to enter what was seen as non- female areas of study…women began to see they could become the doctor or the nurse, the pilot or the ‘air hostess’. In 1975 Ansett became the first Australian airline to employ a woman pilot. This era also saw the expansion of the vocational skills sectors women could be a hairdrsser or a mechanic…women began to break free from stereo-types. Funded child care and after school care were established and allowed women to have greater workplace participation. • Establishment of Medibank to ensure universal health care. Women’s Health Services were established, where abortion, contraception and women’s reproductive health could be openly discussed. • Support and services were funded to ensure that women who had been raped and abused are supported in a range of services run by women for women. “For the first time Australia has a government seriously concerned to give equality of opportunity to women. Women still have not gained equal political representation, equal wages, equal representation on boards and courts, equal justice, peace and freedom. And tragically women are still been raped, abused and murdered…. Maybe Its Time for another revolution…that would be the best tribute to Edward Gough Whitlam …. Another excellent blog,Bett,Yes It’s Time for another revolutiont to gain justice for women in many areas- we need to begin by getting rid of our present PM who couldn’t stand in the shadow of Gough,esp on women’s issues….wonderful post!